I hope everyone had a fantastic Thanksgiving. I took the full week off of work so we were able to really dig in to the nursery projects. This is one of my favorites! When we got married, my grandpa gave us the bedroom set that belonged to him and my grandmother. It included a bed, dresser and two bedside tables. We've used all of those pieces throughout the house, but the dresser was previously being used in our formal living room. 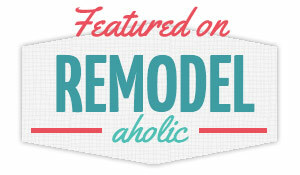 It was originally a shiny cherry wood finish, but we sanded it down to the natural wood. You can see its natural state in this photo from last Christmas. 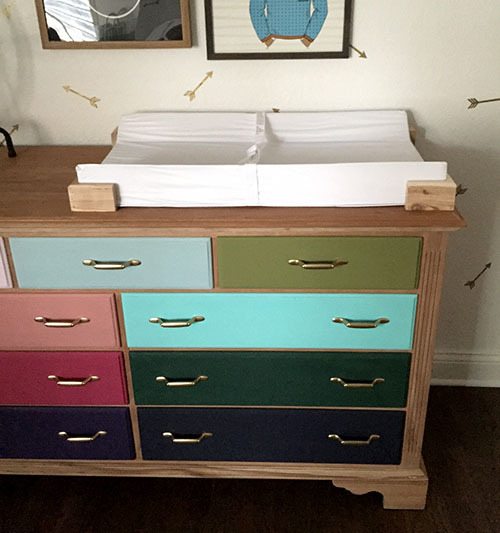 It was the perfect height and size for a changing table/dresser combination, so we decided to move it into the nursery. Because the majority of the nursery was black and white and gold, I really wanted to have some fun with this piece and bring in a lot of color. I thought about many color combinations, but in the end I decided to paint each drawer a different color. 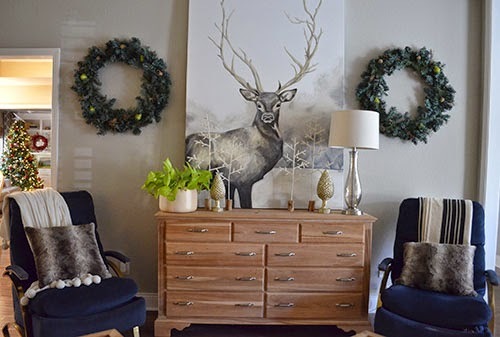 I'm finding the hardest part about designing a nursery for boy and girl twins is finding colors that work for both genders without being too feminine or two masculine. I didn't want to stick to neutral colors like yellow and green, but I didn't want too much pink or blue. It's been a challenge to walk that fine line, but it's certainly a fun problem to have! 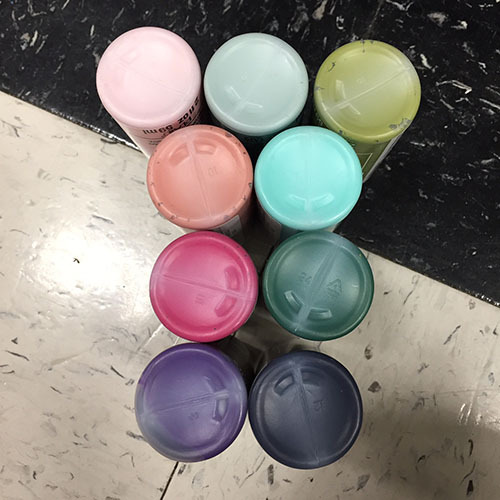 I dragged the husband to Michael's and plopped myself down in the aisle in front of the acrylic craft paints, trying different color combinations. 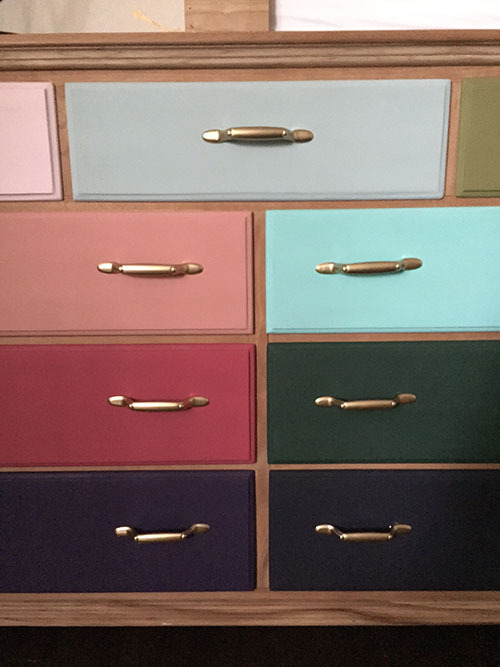 I wanted each drawer to make sense together, so I decided the colors couldn't be too pastel or too neon. The tone of the paint color would be the main thing to keep it all cohesive. I also stuck with matte finish paints because the dresser is matte, and I thought that would make it all look purposeful. 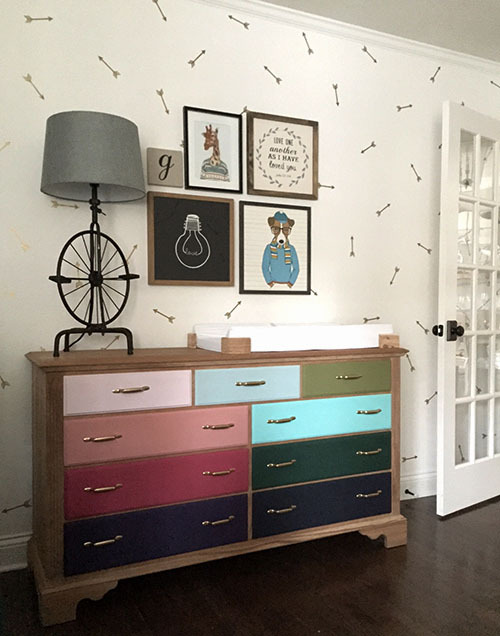 In the end I decided to do a column of drawers with girl colors, a column of drawers with boy colors and a row of drawers at the top that would help tie the two together. I also decided to take a subtle ombré approach to the drawers, keeping the darker shades at the bottom. I arranged them on the floor at Michael's, gave them my stamp of approval and had to get the husband's assistance to get back up. It turns out pregnancy really decreases your core strength. Who knew?! The process was simple. I used a cheap black foam brush to apply the paint to each drawer. Each needed 3-4 coats, depending on how dark the color was. This tiny tube of $1.50 craft paint was plenty for painting one drawer each, so it ended up being really affordable. I even used the leftover paints for some artwork for the room, so we stretched the value of that paint to the max. I was SO happy with how it turned out. It's just the happiest piece of furniture. 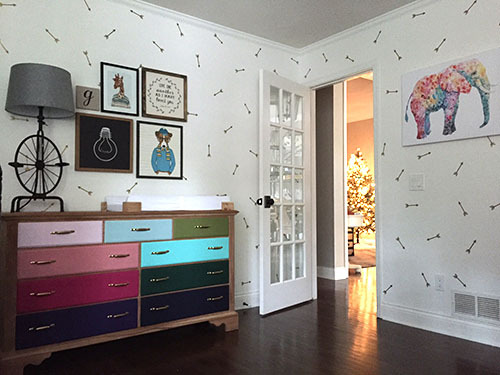 It makes the nursery feel so playful and whimsical. I wish my lighting for these photos was better, but it has been raining for four straight days so my "natural light" is really lacking right now. Once we painted the drawers, the silver hardware was not working anymore. A quick splash of gold spray paint fixed that problem and saved us from having to buy new hardware. I thought about buying something new, but 15 pulls at $5 each really adds up! 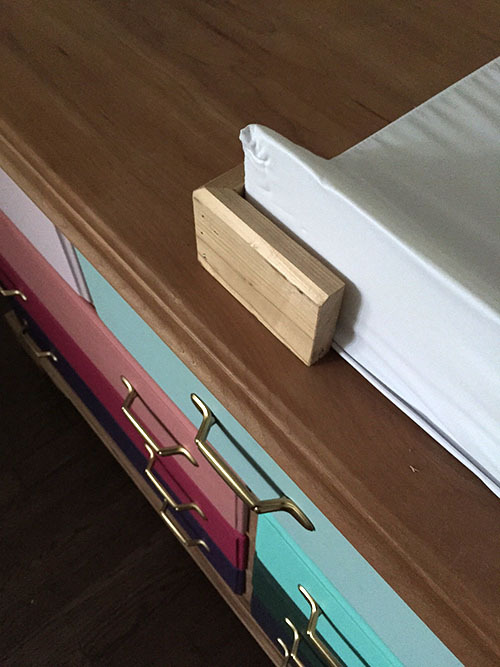 In order to make the dresser into a changing table, the husband used some of his cedar stash to create brackets that keep the changing pad in place. He adhered them to the dresser with a nail gun and some wood glue. They don't match the cherry wood of the dresser exactly, but it's close enough. Doesn't it look great with the colorful elephant artwork (from HomeGoods) we put on the adjacent wall? I'm really enjoying this view from the chair in the opposite corner. This is just one of the projects we've finished for the nursery. It's slowly but surely coming together. I'll be back with more projects soon!